Bangladesh is now facing one of the worst catastrophes of human history where almost two third of its 120 million population is exposed to arsenic poisoning through drinking water. Since 1996 the British Geological Survey (BGS) investigating ground water of Bangladesh and the final report (June 7, 2000) comprises mainly on arsenic in ground water. 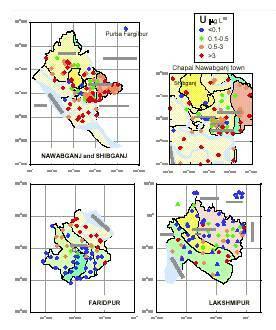 The British Geological Survey/DPHE National Hydrochemical Survey conducted geochemical studies of 3534 tube wells from 61 of the 64 districts of Bangladesh. Samples from the Water Quality Monitoring Network of Bangladesh Water Development Board (BWDB) distributed across the whole of Bangladesh were investigated under the programme. Three Special Study Areas were established in three Sadar (headquarter) thanas of Nawabganj, Faridpur and Lakshimpur districts for detail chemical parameters. It is extremely surprising to note that none of the water departments do not express any concern about the occurrence of high level of radioactive mineral in drinking water of Bangladesh. A high amount of Uranium is found in drinking water of Bangladesh. Natural uranium is a silver-coloured radioactive metal that contains three forms (isotopes) of uranium: uranium-234, uranium-235, and uranium-238. The naturally occurring radionuclides derived from uranium-238,thorium-232,and uranium-235 are products of the radioactive decay series known as the uranium, thorium and actinium series, respectively. Each decay series follows a known sequence of radioactive decay, producing various isotopes that also emit either an alpha or a beta particle as they decay. When uranium decays in the environment transform to radioactive mineral radium which via oral exposure, is known to cause lung, bone, brain, and nasal passage tumors in humans, and radon, via inhalation exposure, causes lung cancer in humans. Uranium may cause lung cancer and tumors of the lymphatic and hematopoietic tissues. Most of the risk from radon in drinking water (nearly 90 percent) comes from breathing radon released to indoor air from household water uses. Radon is the second leading cause of lung cancer in the United States. EPA has classified radium as a Group A, human carcinogen. Radium is a naturally occuring silvery-white radioactive metal formed when uranium decays in the environment. Cancer is the major effect of concern from the radionuclides. Radium, via oral exposure, is known to cause lung, bone, brain, and nasal passage tumors in humans, and radon, via inhalation exposure, causes lung cancer in humans. Uranium may cause lung cancer and tumors of the lymphatic and hematopoietic tissues. EPA has classified radium as a Group A, human carcinogen, and EPA has not classified radon or uranium for carcinogenicity Chronic (long-term) inhalation exposure to uranium and radon in humans has been linked to respiratory effects, such as chronic lung disease, while radium exposure has resulted in acute leukopenia, anemia, necrosis of the jaw, and other effects. One element of potential health concern high-lighted by the analytical data was uranium. This has been assigned a provisional guideline value of 2 µg L –1 (For uranium: 1 µg = 0.72 pCi.) by WHO. 28% of the samples from the three Special Study Areas. The maximum uranium concentration observed was 47 µg L –1 from the Chapai Nawabganj, one of the worst arsenic affected areas of Bangladesh. The atoms in any radioactive material are constantly disintegrating and emitting particles and electromagnetic waves that can cause damage to whatever they hit. Alpha and beta radiation are both charges particles. Alpha radiation is highly ionised . Radiation is harmful because it can “ionise” living matter, making permanent changes in its atomic structure. Cancer, damage to developing cells in the fetus and growing children, and mutations of chromosomes are among the chronic effects of exposure to ionising radiation. The two types of isotopes with radioactive decay that carry the most health risk due to ingestion of water are alpha-particle emitters and beta/photon-particle emitters (Lappenbusch and Cothern,1985).Many radionuclides are mixed emitters with either an alpha or beta emission coupled with gamma (photon) emission, or in some cases, all three. Each radionuclide has a primary mode of disintegration. The most common, heavy, naturally occurring radionuclides are largely alpha-particle emitters, although their progeny often emit beta particles. The alpha-particle emitting radionuclides discussed in this report include two isotopes of radium (Ra-224 and Ra-226) and polonium-210.Alpha radiation is composed of a particle, consisting of two protons and two neutrons, spontaneously emitted from the nucleus of a subset of radioactive elements (mostly the heaviest elements) during radioactive decay. Alpha radiation is ionizing radiation, meaning that it strips electrons from adjacent atoms as it passes.Alpha radiation cannot penetrate skin;thus,an alpha-particle emitting radionuclide must be ingested in order to come into contact with internal tissue.Because of the large size,alpha particles are likely to collide with cell tissue,causing tissue damage.An accumulation of tissue damage in the cell nucleus may lead to cell mutation and potential cancer. Animal studies have reported inflammatory reactions in the nasal passages and kidney damage from acute inhalation exposure to uranium. Acute animal tests, such as the LC50 and LD50 tests in rats, mice, and guinea pigs, have shown uranium to have low to moderate toxicity from inhalation exposure and high toxicity from oral exposure. Several studies have related inhalation exposure to uranium in humans with an increase in deaths from nonmalignant respiratory disease. One study reported kidney effects in humans following exposure to uranium, while several other studies have found no increased deaths in uranium workers due to kidney disease. Animal studies have reported effects on the kidney from chronic inhalation and oral exposure to uranium. The RfD for uranium (soluble salts) is 0.003 mg/kg/d based on body weight loss and moderate nephrotoxicity in rabbits. Chronic exposure to radium in humans, by inhalation, has resulted in acute leucopoenia, while oral exposure has resulted in anaemia, necrosis of the jaw, abscess of the brain, and terminal bronchopneumonia. Chronic exposure to radon in humans and animals via inhalation has resulted in respiratory effects (chronic lung disease, pneumonia, fibrosis of the lung), while animal studies have reported effects on the blood and a decrease in body weights. Limited evidence from epidemiological studies suggests that uranium or radon exposure may result in a decreased ratio of live male to female births in humans. Animal studies have not reported adverse reproductive effects from inhalation exposure to uranium, while fetal toxicity, reduced offsprings, and degenerative changes in the testes were noted from oral exposure in animals. Radium and radon are potent human carcinogens. Radium, via oral exposure, is known to cause lung, bone, brain, and nasal passage tumors. Radon, via inhalation exposure, causes lung cancer. Smokers exposed to radon are at greater risk for lung cancer (approximately 10 to 20 times) than are nonsmokers similarly exposed. The U.S. EPA, U.S. Geological Survey (USGS), U.S. Bureau of Land Management, U.S. Department of Energy, and Utah Department of Environmental Quality are conducting a joint demonstration of permeable reactive chemical barriers at an abandoned uranium upgrader site in Fry Canyon. Each of the three barriers consists of different reactive materials: Cercona Bone Char Phosphate (PO4), Cercona Foamed Zero Valent Iron (ZVI) pellets, and amorphous ferric oxide (AFO). points are located downgradient of the barriers in the colluvial aquifer. Uranium concentrations are monitored in all three barriers. Prior to entering the PO4 barrier, the contaminated ground water contains 3,050-3,920 ug/l dissolved uranium. After traveling 2.0 feet along flowpath 1 into the reactive barrier, the uranium concentration is reduced to 10 ug/l (US, EPA 1997). Aeration of water to promote the release of radon is very effective and one of the more affordable water treatment technologies available. It is not known the sources of high amount of uranium in ground water of Bangladesh and any research studies on this are not known. Uranium gets into water from rocks in aquifers and from tailings of uranium mines and mills. In USA two hundred million tons of uranium tailings are located around twenty six mills in New Mexico, Wyoming, Utah, Colorado, Washington and Texas. In Bangladesh uranium rich sediments or uranium tailings do not exist. Recently,high concentrations of radium were found to be associated with ground water that was geochemically affected by land use (agricultural) practices in recharge areas (USGS, 1998). Po-210 was found at an unusually high concentration (290 to 607 pCi/L, for uranium: 1 µg = 0.72 pCi.) in a well used for drinking water in Louisiana (Mullin,1982)and was above 2 pCi/L in some wells in the Grants Mineral Belt of New Mexico (Kaufmann and others,1976).The source of Po-210 in the well in Louisiana is unknown .Uranium ore of mine- able grade was presumed to be the source of Po-210 in the wells in New Mexico. It is not known if changes in water quality as a result of mining increased the mobility of the Po-210.Po-210 has also been found in a shallow aquifer in west-central Florida (Harada and others,1989).Uranium-enriched phosphatic strata that contains sulfidic acidic water high in Rn-222 characterize the aquifer. Phosphate and phosphogypsum fertilizers applied to agricultural lands contain trace radioactive nuclides which originate with the rock phosphates. Radionuclides, including uranium (U), radium (Ra) and thorium (Th), and their decay products can remain in these fertilizer products. Uranium in rock phosphate ranges from 3-400 mg/kg in deposits around the world (Mortvedt, 1992). During processing, much of the U, up to 67% of the initial concentration, and Th will remain with the phosphate fertilizer, while Ra will be contained primarily in the phosphogypsum by-product (Rutherford et al., 1995). The U content of triple superphosphate will be greater than that of phosphoric acid because the phosphoric acid, initially obtained from the rock phosphate is concentrated and reacted with additional rock phosphate, resulting in an U concentration approximately 3 times greater than in the phosphoric acid (Erdem et al., 1996). 238U concentration in rock phosphates around the world varies considerably, 90-4800 Bq/kg; a similar range is found for 226Ra, 40-5022 Bq/kg. The 232Th concentrations are lower, 16-622 Bq/kg. The rock phosphate from Tunisia, with 238U content of 4400 Bq/kg, 226Ra content of 5022 Bq/kg and 232Th content of 622 Bq/kg, when processed into superphosphate had concentrations of 3740, 3394 and 420 Bq/kg for U, Ra and Th respectively, and when processed into triple superphosphate had concentrations of 6940, 3116 and 362 Bq/kg for U, Ra and Th , respectively (US EPA, 747 R98.003, 1999). Arsenic concentration in ground water has been correlated mainly with the use of Superphosphate in Utter Pradesh, India (Murti, 1987). Bangladesh and W. Bengal, India started green revolution thirty years ago – agrochemicals that was not known before massively increased without control and the knowledge of adverse consequences. Bangladesh is an open free market (without quality control), where fertilisers and others imported or exported legally or illegally depending on market situation. Farmers of Bangladesh always suffered from the application of agrochemicals – firstly they do not posses any knowledge about agrochemical, secondly traders stock-piles the chemicals to make an artificial scarcity that sky rises the price and thirdly a very low quality of fertilisers or pesticides with unknown added constituents are introduced in the market. There are any controlling authority, when exists, do not posses any capability to analyse heavy metals or chemicals. If one looks at the column of district news in daily newspaper of Bangladesh, will find several protests of the farmers in the areas now extremely arsenic contaminated area. In 1992 Bangladesh Agricultural Development Corporation (BADC) obtained a credit from the Asian Development Bank to import fertiliser from the USA. Stoller Chemical Company in association of Gaston Copper Recycling Co, and South Wire Corporation of USA exported 6300 metric tonnes of fertiliser to Bangladesh. This fertiliser contained extremely hazardous heavy metal concentration that exceeds thousand times than allowable level. This is a tiny part of the iceberg. No body knows the constituents of other imports. Ratan et al. (1997) reports possible hazards associated with metals of surface water bodies of Bangladesh due to anthropogenic activities. Surface water samples from Rajrampur of northwestern Chapai Nawabganj (one of the worst arsenic affected areas). The surface water investigated by Peuraniemi, V., Institute of Geosciences and Astronomy. Oulu, Finland (1999) and reports that the largest lake at Rajrampur is surrounded by agricultural land contains by far the highest level of arsenic, likely derived from agriculture. They also reported elevated concentrations of As, Cr, Cu, Ni, Pb and Zinc in soil samples(Islam, et al., 1999). This is most likely that the use of uncontrolled agrochemicals is likely the source of multiple hazards in Bangladesh. Bangladesh needs Agrochemical Regulations and Controlling Authority like in the industrial countries.